Markets are naturally designed to be rough & tough. However, not designed for linear logical thinking. Todays Trading session in Nifty and Bank Nifty Futures is clear example for how complex information we are dealing with. 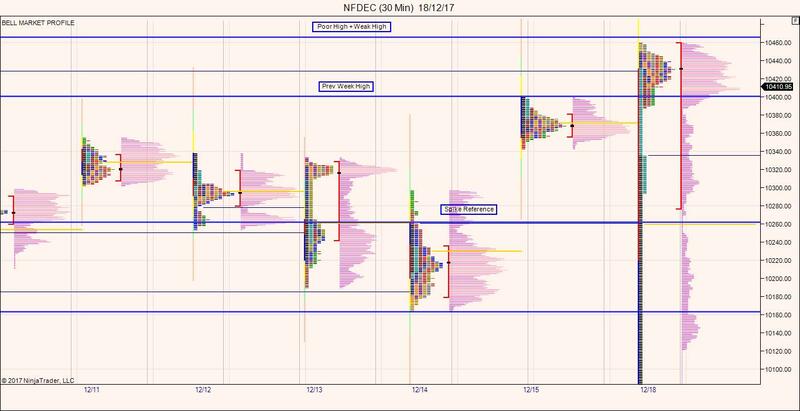 Nifty Futures sentiment turns positive on weekly timeframe indicating a possible shift in the higher timeframe view. Nifty futures 1st hour turnover was at 30 day high ( 13012.28Cr ). Price rejection is strong right from the opening emotional liquidation. Trading sentiment holds positive for the last two trading session. Trading the markets are rough despite the news outcomes like Gujarat Exit polls and Gujarat election results. Put writers are aggressive at 10000PE, 10100PE, 10200PE, 10300PE strikes. Market Internals are moderately holding positive though start of the series market internals turns negative for quite some time. Nifty forms a P shape profile on Monday trading session. Morning Trading sentiment Emotional Gap down combined with emotional liquidation move has been followed by strong price rejection towards Friday high. Price sustained and accepted above Friday high. Positional trading sentiment holds positive with P shape shorter term reference comes around 10388. Carry forwarding Positional shorts might not be a profitable business for rest of the series. Near term supports are expected around 10343 in Nifty Futures. Sideways to strong uptrend might prevail.